Here you can read about our software, download icon editors and register copies for immediate use, download image collections, order custom icons and ask questions about the use and performance of our products. Browse, view, organize and convert your digital images with AhaView! ArtIcons Pro is an international icon solution. Convert multiple images to Windows icons in a single action with Any to Icon! Click here for full product listing. From creating original icon design ideas to downloading complete themed icon sets, Aha-Soft.com lets developers take control of their icon needs. Icons are integral visual components of most applications and computer environments, and the inclusion of attractive, appropriate, and meaningful icon design principles in a software product can add immeasurable value for users. Finding the perfect icon or set of icons, however, can be a considerable challenge. Attempting to master icon design without the right tools or browsing endlessly through expensive or poorly-made stock icons can waste time and lead to frustration. Thankfully, Aha-Soft.com offers sensible and affordable solutions catered to any and every development project. A comprehensive range of toolbar icons, desktop icons, and images for various other small-format applications is available at Aha-Soft.com, where icon design professionals deliver flawless work suited to a wide variety of categories and functions. Developers and anyone else in search of icon graphics can find glossy icons or more classic, refined styles, as well as icon sets that beautifully illustrate business, automation, travel, and other popular topics. From icons that have the perfect look for iPhone apps to those designed to work wonderfully with specific operating systems, Aha-Soft.com has every type of icon needed to make development projects look great. When designing a completely original graphic is preferable to working with stock icons, Aha-Soft.com's visitors can take advantage of the site's simple icon software. Allowing even novices to create and modify smooth, clear icons, this program can make achieving the perfect piece a lot easier. Whether starting from scratch with icon design creation software or choosing from a nearly endless catalog of stock icons, developers can say goodbye to frustrating searches and confusing graphics programs, and can populate their projects with icons that look and feel just right. With a number of sizes and formats from which to choose, making icons fit perfectly into any environment is a breeze with Aha-Soft.com's invaluable resources. Any to Icon 3.59, ArtCursors 5.30, IconXP 3.39, ArtIcons Pro 5.52, IconUtils 5.48, AhaView 4.60. 98 religious icons for iPhone and iPad developers. 122 people icons for iPhone and iPad developers. Different models for Glass Project. High Resolution App Tab Bar Icons contain 1845 icons now. Icons for 3D printing and 3D design. Let your software products and Web sites look great. Instantly improve and modernise the graphics of your project with a set of Large Glossy Icons. Tab bar icons for iOS and Win8. This set contains 632 icons. Application Bar Icons for Windows 8 contain 1186 icons now. Large Menu Icons with source files. Icons for iPad, iPhone apps. Business iPhone Icons for iOS development. All Menu Icons set packs 13,000 icons into a huge value pack. Medical Icons for Windows Phone 7. Create new sites with Perfect Web 2.0 Icons! This web 2.0 icon collection includes 246 unique icons. Design professional looking ribbon-based interfaces with Ribbon Bar Icons! This huge collection includes 758 unique icons. Avia Software Icons set is a good choice for more then just aviation sites. A large set of medical icons for Windows 8 development. A set of blue-colored Android-styled icons. A rich collection of practical and eye catching icons representing all basic operations required for application development. Professional Toolbar Icons is a new collection of bright, professional icons that can be used to add clarity to any web page or application user interface. 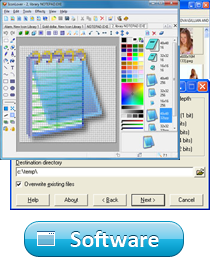 Icons for Windows 7 and Vista is a bundle with 18 icon collections. It includes 3200 unique icon designs. All Perfect Icons Bundle contains 29 icon sets with 79800 icon files. Every handcrafted icon is supplied in a number of resolutions (16x16, 20x20, 24x24, 32x32 and 48x48 pixels). Database Icon Set is updated. It includes a lot of images of various database-related items and symbols. Icon sizes are from 512x512 to 16x16. Let your architecture products and Web sites look great. Instantly improve and modernise the graphics of your project with a set of Desktop Building Icons. More than three hundred perfect icons for business software. Interface icons for Android developers. 604 stylish high resolution tab bar icons for iPhone, iPad, and iPod apps. Android Dialog Icons offer Android developers a quick and easy way to create stunning dialogs in their apps. These icons for automation software can all be found in one place now! Your order gets you 159 unique icons.